Among the various biblical texts that deal with the theme of Christmas, one that strikes us quite sharply is the passage from St. Paul’s letter to the Philippians, Chapter 2, verses 1 to 9. Here St. Paul speaks about the attitude of the Son of God which enabled Him to incarnate and to be part of the human history. St. Paul says: “Have among yourselves the same attitude that is also yours in Christ Jesus, who, though he was in the form of God, did not regard equality with God something to be grasped. Rather, he emptied himself, taking the form of a slave, coming in human likeness, and found human in appearance; he humbled himself, becoming obedient to death, even death on a cross.” Christmas is in fact this attitude of Jesus Christ. It is the readiness on the part of the Son of God to come down from the height of divine glory to the depth of human limitations; that too to the extent of taking the form of a servant, being ready to undergo the most humiliating death on a cross. Christmas is essentially a ‘coming down’. There is no parallelism between the divine existence and the human existence. They are entirely two different existences. Divine existence is infinite and unlimited; whereas the human existence is a heap of limitations. The difference is not just in degrees, but in the very essence. Christmas means, the One without any beginning subjects Himself to time; Eternity embraces death; Almighty assumes limitations; the Creator becomes a creature; Pure Existence loses itself in emptiness. 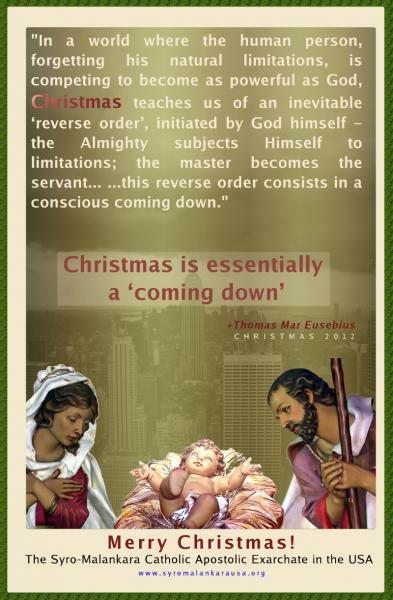 This is the essential message of Christmas – the readiness to come down. In the contemporary triumphalist culture, this message could be ridiculed. In a culture where our whole focus is on gaining, winning, defeating, capturing, ascending, reaching on the top, to be in the limelight, etc., the invitation to lose consciously, to let others win, to descend, to be in the background, etc. could look ridiculous. But this is what Christmas signifies to us. In a world where the human person, forgetting his natural limitations, is competing to become as powerful as God, Christmas teaches us of an inevitable ‘reverse order’, initiated by God himself – the Almighty subjects Himself to limitations; the master becomes the servant; the teacher washes the feet of His disciples; this reverse order consists in a conscious coming down. This attitude of God is what we call Christmas. In the same passage, St. Paul details on this attitude of Jesus Christ. All of us ‘need to be of the same mind, with the same love, united in heart.’ We shall ‘do nothing out of selfishness or out of vainglory.’ In a culture where profit and competition matter the most, how important it is to assume a selfless, noncompeting attitude! St. Paul continues, “humbly regard others as more important than yourselves, each looking out not for his own interests, but also everyone for those of others.” This is the attitude that Christ Jesus had and this is the attitude of Christmas. The panacea for all the problems that our culture is going through is this attitude. What we need is the readiness to come down and to bow down. The basic restlessness in our families, in our communities and in our societies is to be attributed to the lack of this readiness, the readiness to consider the other more important than oneself. Why do our family bonds disintegrate? Why are there so many divorces in our times? Why are there infights and competitions in our communities? In fact all the problems in a family will disappear the moment some persons become ready to assume less importance for themselves. Christmas means the humility that enables me to consider the other more important than myself. I wish and pray that our Christmas be for all of us, an experience of grace that enables us to imbibe this attitude of Christ Jesus.